It was Izzy’s 3rd Birthday yesterday! Thanks to Martyn, Hannah & all the kids Izzy also had a lovely BBQ party. Izzy loves food so although she said she didn’t want a birthday party a BBQ was acceptable. She loved munching away on sweet treats, sausages & burgers across the day. I caught her looking pretty chilled out with all the kids watching TV, munching away haha! 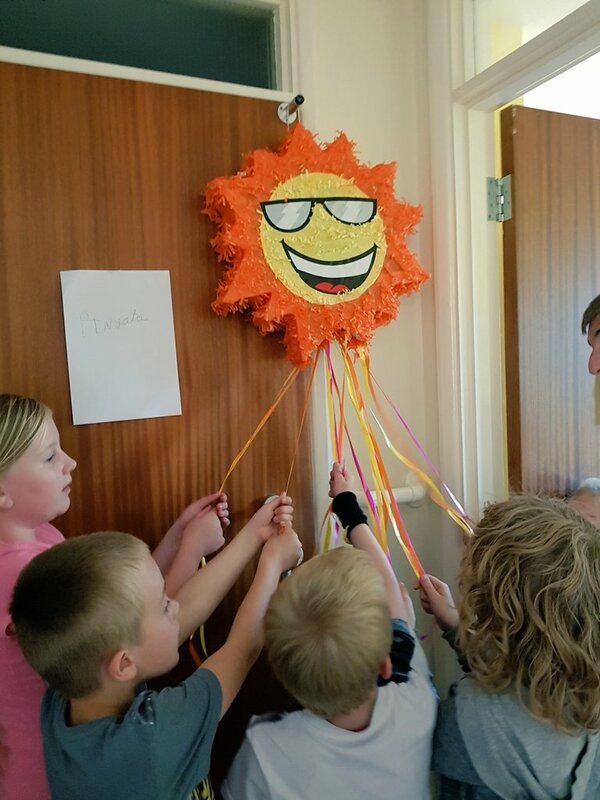 Hannah had some fab party supplies that the kids all loved, especially the Pinata and party bags! All the kids had fun scrabbling to get the most sweets. We had a slight accident where Izzy hit her head quite hard and ended up with a small cut. She was soon happily playing and eating again though. She even seemed slightly impressed looking at herself in the mirror! Izzy loved spending the day with everyone and singing her favourite song with Martyn. ‘Beer Beer Beer – an ode to Charlie Mops’ she heard at the Rochester Dickens festival and has loved it ever since! After a very long busy day and a rather late night she finally woke up after an hour of me waiting impatiently to celebrate her 3rd birthday. Snuggling up on the sofa with daddy to help her unwrap her presents she squealed excitedly as I passed each one over. Along with my Paw Patrol haul all from pound shops apart from the lookout tower I think she did fairly well! Izzy also got a cool looking scooter with tilt steering which she couldn’t wait to try out. She is slowly getting the hang of tilting it and pushing herself along. 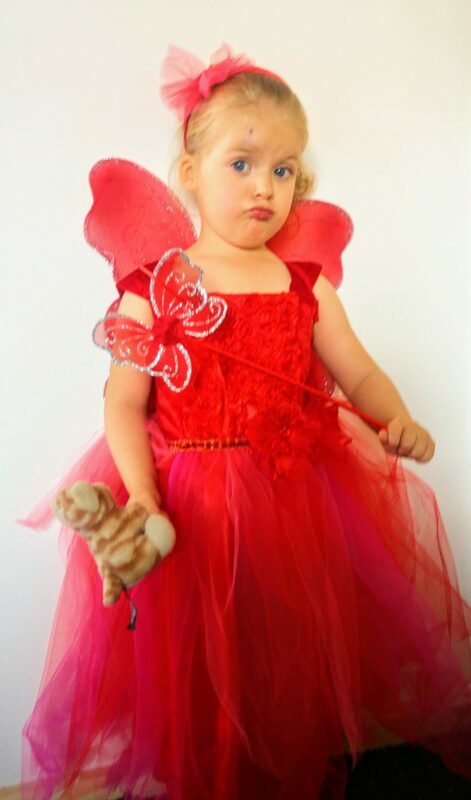 She received this absolutely gorgeous Garnet Fairy Set from Pretend to Bee which she couldn’t wait to put on! Complete with wings, wand & headband this gorgeous outfit is adorable & something Izzy would have picked out herself. She has barely taken it off since and wanted it on first thing this morning! I wouldn’t definitely say it is well worth £25 for this stunning fairy set, the dress is so well made and lovely and soft inside. Putting a spell on Mummy! Across the day a few of our friends came by with even more presents & she was most definitely spoilt! It was most definitely all about Paw Patrol this year, she has a huge Sky & Everest balloon and lots of new characters & vehicles! Eva got a lovely soft Rainbow Dash too so she didn’t feel left out which was lovely! We ended Izzy’s birthday with yet another birthday cake. Afterwards she happily went off to bed hugging her Skye LED Night light. I think it’s safe to say she has had a fantastic 3rd birthday! 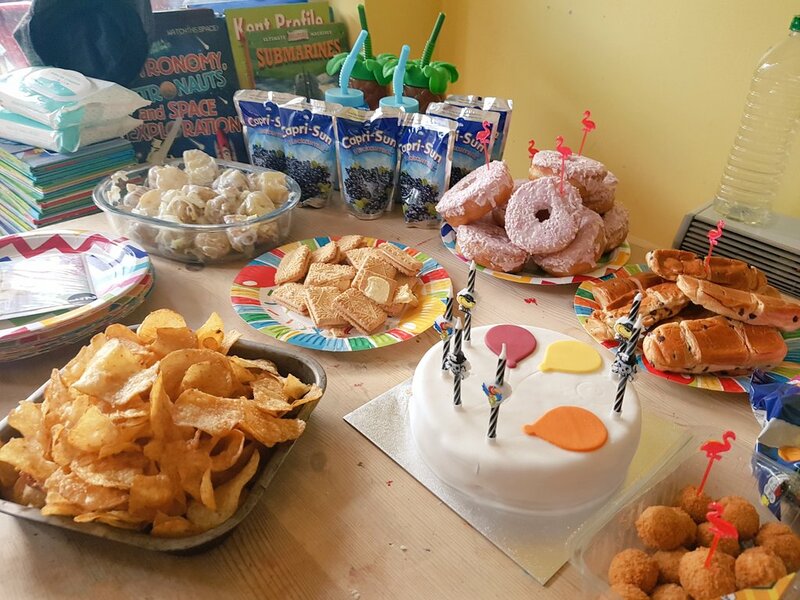 I always worry that lack of family will make special occasions a bit rubbish, most kids have aunts, uncles, cousins etc to play with so Martyn & Hannah organising a BBQ for Izzy means a lot. It meant she got to spend the day playing with other kids and having fun!